March is a new month, so new challenge. Weather should be clearing soon for some of you so hopefully you will join in. 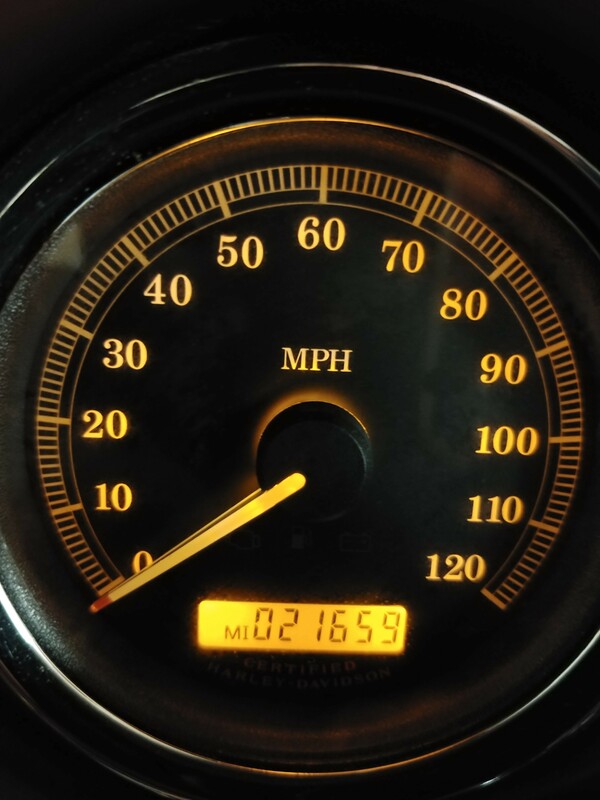 Make sure and post you odometer picture anytime after February 1st. Are there any changes needed to challenge? Anyone can participate, are you up for the challenge. Then post new odometer picture here. 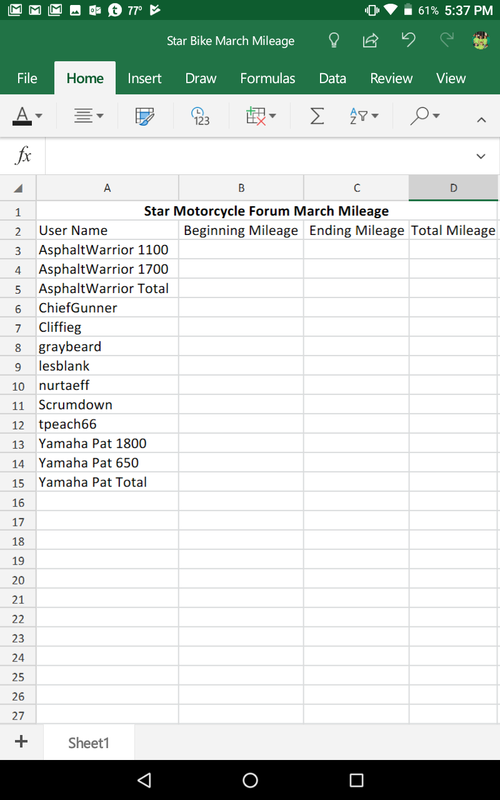 Check back for updated spreadsheet. nurtaeff and Scrumdown like this. Last edited by lesblank; 04-01-2019 at 07:51 PM. I'll sign up as soon as my bike is back from the shop (upgrades, upgrades). Couldn't take a picture of the odo for February. Here is my beginning odometer reading. Not going to be a great month for me again. I do have a three day trip scheduled next week but rest on month I will not be riding much. On March 21 is my next skin cancer surgery on my temple so no helmet again for a few weeks. Oh well, have to be semi healthy to ride. It's been a down and up month for me. First losing the belt on the Strat and having to drive a car for a week. Then finding Strats little sis Cherry to end the month. Not a lot of miles but a lot of fun and excitement. Same milage as I ended last month with. Start miles for march same as end of feb. 20062. 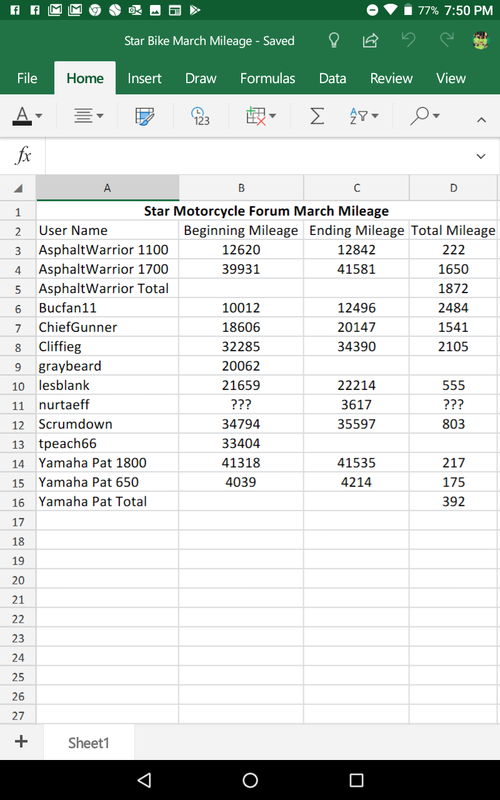 I updated the beginning mileage for those that posted. Everyone, please proof to make sure I didn't fat finger anything. Thanks, ride often and safe.